Put the chopped dates in a vessel and add sufficient water to cover the dates. Cook on medium flame till it become soft. Let it cool and grind it to a paste. Put the dates paste in a non-stick tawa and add jaggery powder and coconut gratings. Cook it on medium flame stirring continuously till it blends well and look like halwa. Remove and keep it aside. Boil 2 to 3 cups of water along with a teaspoon of oil and two pinches of salt. When the water starts boiling, reduce the heat and add the rice flour and stir continuously till it become a thick dough. Switch off the stove and cover with a lid. After few minutes remove the lid and allow the dough to cool. When it is warm enough to handle, knead it well. Grease your fingers with little oil, take an orange size dough and spread it a thin round or using a rolling pin roll it like a puri. Take a tablespoon of dates paste and spread it over the rice puri. Gently roll it (like making spring rolls) and seal the edges by closing it. Arrange the Kozhukattai in a greased plate and steam cook it for ten minutes. Allow to cool for few minutes and remove from the plate. Serve as it is or cut it into small rounds and serve. Your recipe for dates kozhukattai seems to be an easy one. Will try this for Vinayaka chathurthi, a new variety of kozhukattai for Ganesha! Thank u for your recipe. Thank you Geetha Gopal. Please try and let me know your feed back. Really nice idea. Let me try this. 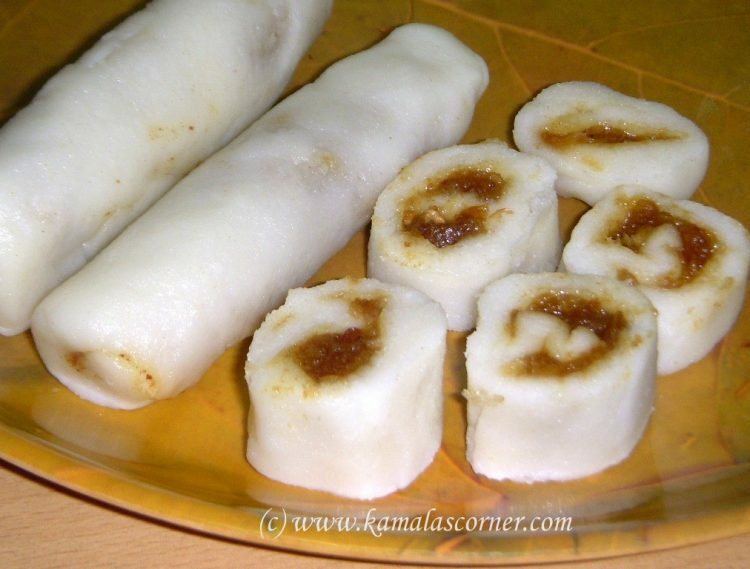 One more tip in making the kozhukattai – add one teaspoon of milk in the boiling water along with oil and you will get the kozhukattai nice white in color. Thank you for sharing your idea of adding milk in the water. I will add this information in my Kozhukattai Post so that other readers will also benefit. I accidently noted this recipe and living in Saudi Arabia, in the middle of Dates land, I must make an attempt to make this item and send my feedback to you. Oh superb! My dad bought me a pack of dates but I never opened that pack daily getting scolding from mom now ill make dates into kolukattais and give to all my family members …. thanks you so much….. Try this kozhukattai and let me know your feed back. Nalla Irukkum. Pl try and let me know your feed back. Thank you Jyothi for your kind feedback. i will cook it very sure as my 3yrs old son will love it alot…. What kind of pan do you use to steam cook the circles? We use “Idli Cooker”, a kind of steamer.